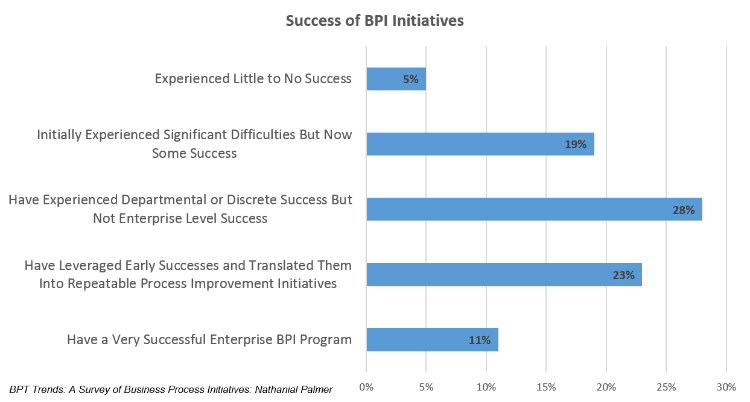 Many, if not most, organizations engaging in Business Process Improvement (BPI) initiatives today appear to be experiencing a fair degree of success in their efforts. Though many have enjoyed success, a more limited number have been able to attain enterprise-level success and maturity. Alarmingly, there are up to 1 in 4 organizations that have been entirely unsuccessful, and/or have encountered significant difficulties in the success of their process improvement initiatives! The success of Business Process Improvement Initiatives. Click to view larger. How are these organizations measuring success? To what degree does measurement impact the success of BPI initiatives? Many companies use return on investment (ROI) or other related measures to determine whether their investment in business process improvement programs or initiatives is successful. However, there is a bit of variability in how they leverage this measurement. 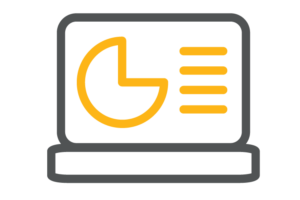 Some organizations do point-in-time analyses either as part of the upfront business case or after an initial pilot to better understand the pilot outcomes. These analyses are useful, but they primarily give you a rough quantification of the order of benefit magnitude expected. Additionally, point-in-time analyses miss the more holistic view of how the initiative delivers value over time. 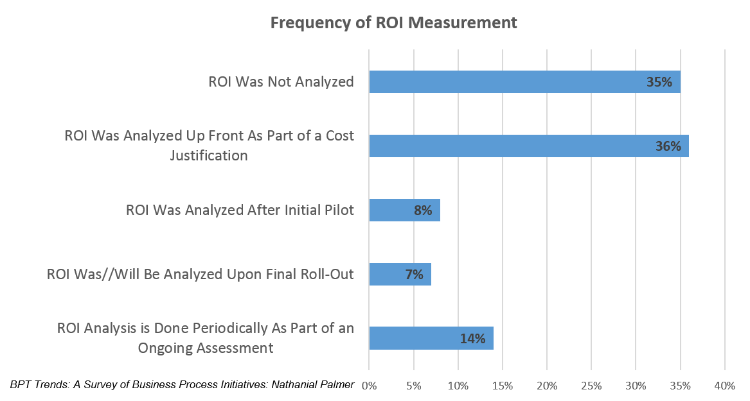 The frequency of ROI Measurement. Click to view larger. Ongoing ROI analysis demonstrates a level of commitment to understanding and measuring the business value generated by BPI Investments. Often times, organizations with this level of commitment have a better story to tell about the results of their efforts and are able to reinforce leadership attention and a case for future initiatives. Why then are relatively few organizations able to institute an ongoing measurement program? 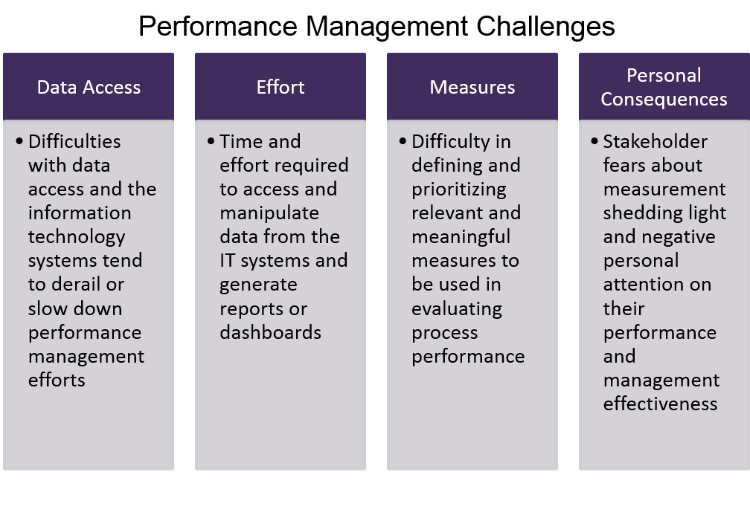 Performance Management Challenges. Click to view larger. Understanding and communicating the anticipated business value of the BPI initiative, maintaining strong, visible leadership commitment, and proactively engaging in change management are key to overcoming roadblocks. For more details on how to best address these challenges, join me for our next installment. 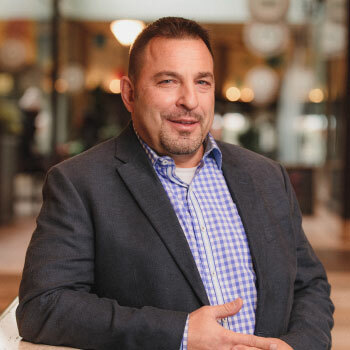 Mark Buchynski is a leader on the Centric Chicago team and is a results-driven executive with more than 20 years of professional experience. He uses his operational expertise and process-oriented background to review clients’ existing processes and recognize risks and opportunities associated with current performance. Mark is successful in leading change initiatives by focusing on critical drivers of initiative adoption. Contact Mark to learn more. Want to learn how our PEX approach can help you?